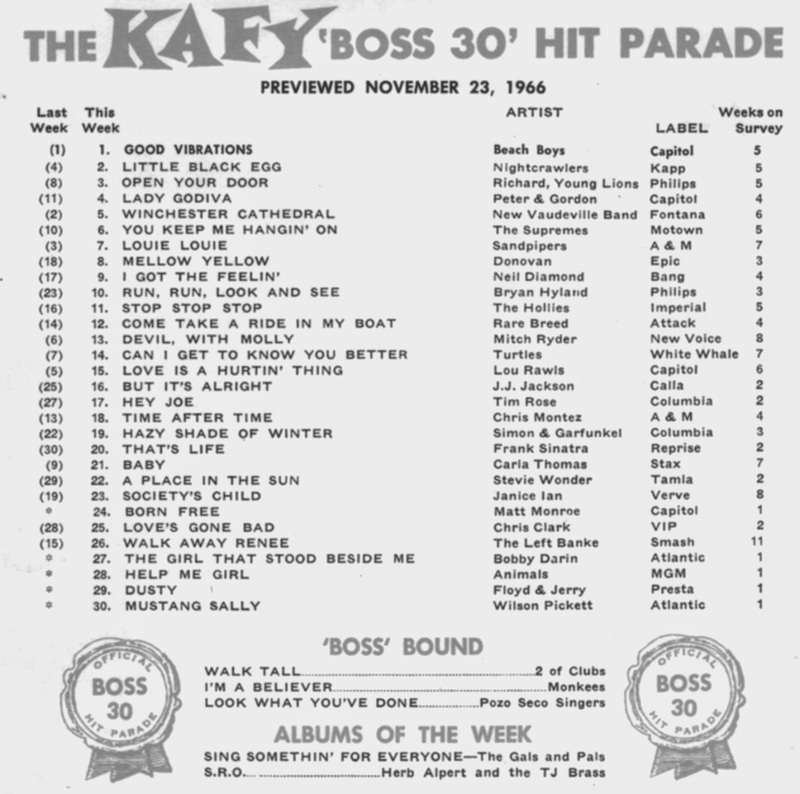 We've run this chart before in Forgotten Hits ... perhaps most unique because it's dated the same date as The Kennedy Assassination ... November 22, 1963. Our FH Buddy Bob Hale was responsible for counting them down this day but his show was preempted by the non-stop news coverage coming out of Dallas ... where all of America's world was turned upside down. Only 90 minutes earlier, President Kennedy had been officially pronounced dead at Parkland Hospital. Nationwide, all eyes and ears were on Dallas, looking for ANY new details that might help to make sense of this tragedy. 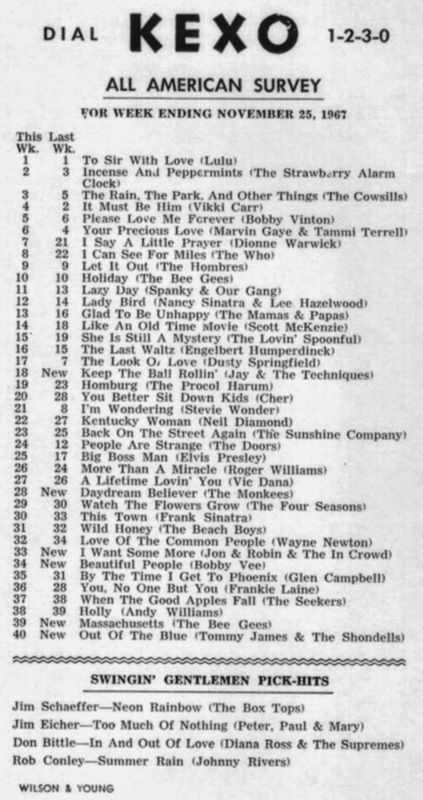 The WLS Silver Dollar Survey spotlights some great music from late-1963 ... personal favorites include "Wonderful Summer" by Robin Ward, "She's A Fool" by Lesley Gore, "Deep Purple" by Nino Tempo and April Stevens, "I Can't Stay Mad At You" by Skeeter Davis and "Fools Rush In" by Rick Nelson ... when's the last time you heard ANY of these on commercial radio??? Meanwhile, odd-ball (by comparison!) tracks like "Jam Up And Jelly Tight" by Tommy Roe, "Cherry Hill Park" by Billy Joe Royal, "Love And Let Love" by The Hardy Boys and "Groovy Grubworm" by Harlow Wilcox can also be found on this week's Top 30. An eclectic mix to be sure! 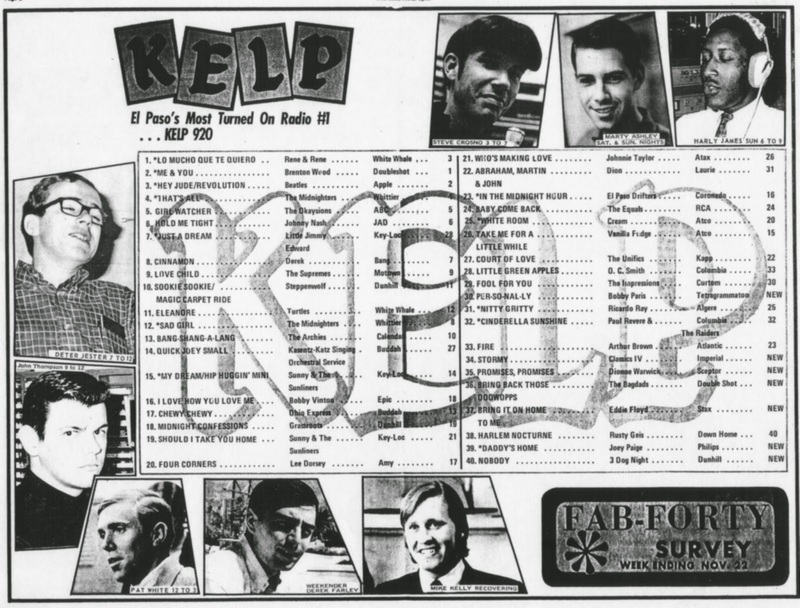 El Paso's KELP was also serving up an unusual mix of music back in 1968. Thee Midnighters have TWO Top 12 Hits: "That's All" is at #4 this week and "Sad Girl" is at #12. Neither one of these records made the Billboard chart ... and once again harken back to a much older sound. Boy, Clark Besch sure sent us some VERY interesting charts for this week's Saturday Surveys feature! Yes, you've got The Beach Boys topping the KAFY "Boss 30" Hit Parade with their monster hit "Good Vibrations" ... but that one was #1 EVERYWHERE. So check out numbers 2 and 3!!! "Little Black Egg" by The Nightcrawlers (a garage band classic if there ever was one) holds down the #2 spot ... and one of Dave The Rave's all-time favorite bands, Richard and the Young Lions are ranked at #3 with their hit "Open Your Door". Also on the chart is the Rare Breed version of "Come Take A Ride In My Boat" ... which would go to the top of the charts a year later when it was re-recorded as "Come On Down To My Boat" by Every Mother's Son! "She's Not There" climbs to #5 this week for The Zombies on The Billboard Hot 100 Pop Singles Chart. "Have I The Right" is at #7, "You Really Got Me" is at #8 and "Time Is On My Side" is at #10 for The Honeycombs, The Kinks and The Rolling Stones (respectively). 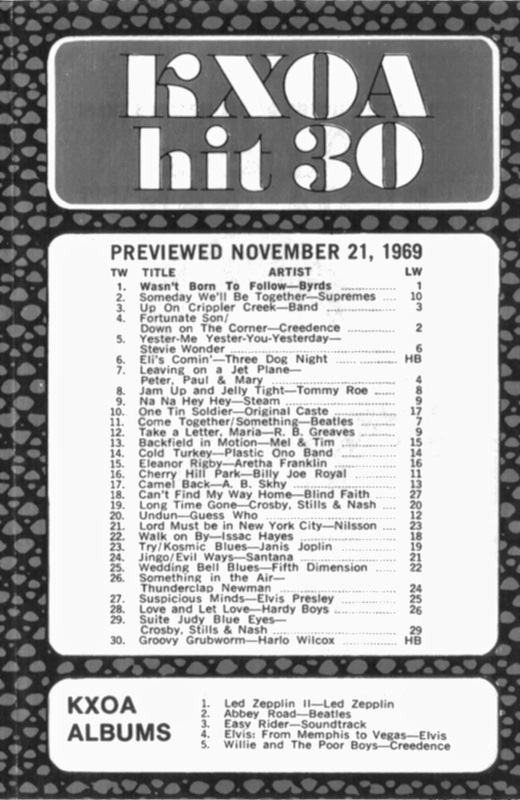 "Do Wah Diddy Diddy" falls to #15 for Manfred Mann while Herman's Hermits climb to #20 with "I'm Into Something Good". Peter and Gordon ("I Don't Want To See You Again", #26), Gerry and the Pacemakers ("I Like It", #28), "When You Walk In The Room" (#35 for The Searchers), "Everybody Knows" by The Dave Clark Five (#37) and "I'm Crying" by The Animals (#40) round out The British faction of The Top 40 this week. The Nashville Teens sit just outside The Top 40 with "Tobacco Road" ... it falls from #15 to #41 this week. Manfred Mann make a HUGE leap (from #71 to #47) with "Sha La La" while The Dave Clark Five climb from #78 to #63 with "Any Way You Want It". Chad and Jeremy also show some positive movement with their latest as "Willow Weep For Me" climbs from #94 to #79. Premiering this week at #81 is "The Wedding" by Julie Rogers. The Zombies are in at #2 with "She's Not There" ... they'll take over the top spot in a couple of weeks. The Kinks fall to #4 with "You Really Got Me" but The Rolling Stones enter The Top Ten for the first time with "Time Is On My Side"
For reasons that will become painfully obvious as you continue to read this article, this has got to be one of the toughest reviews and commentaries I've ever had to do. Frannie and I had never seen The Little River Band before ... but we both love their music (and have loved this music since it first found its way to America back in 1976). HOW WERE THEY? : Musically, they were outstanding ... great musicianship ... incredible harmonies ... they performed every hit you'd ever want to hear to rousing applause throughout the night. I always enjoy your news feeds and although I’m on the other side of the world, I still take a great interest in all your posts. I notice that you’re listing shows by the ‘Little River Band’ (which I drove through just the other day), who started their careers in Melbourne Victoria. I’m not sure whether you realize it, but this band has nothing to do with the original band and merely features a US muso who was picked up to help with tours over there. He was smart enough to register the name (it's hard to believe that the original band or their management had never got around to doing that!) and now tours his version of LRB, while the original members are legally prohibited from performing under any version of that name. I’d be interested to know if this story is known in the US? Well, it was news to me ... and I would suspect to most booking agents and venues as well, since these guys are regularly promoted as being the popular, hit-making band from Australia ... and refer to themselves that way as well. Apparently, however, is no longer the case. The Little River Band is considered to be one of Australia’s most significant bands. Worldwide album and CD sales now top 30 million. They also set a record for having Top 10 hits for six consecutive years. The first band to achieve that mark. The Arcada Theatre is proud to present this extraordinary band! Get ready to hear all your favorite hits like: “Reminiscing,” “Take It Easy On Me,” “Help is On Its Way” and many more! And, incredibly, they're not even from Australia!!! They're a bunch of Americans who, through some legal mumbo-jumbo acquired the rights to the band's name and are now out regularly performing (and impersonating) the band who REALLY accomplished all of the distinctions being touted above (all of which are regularly promoted in their advertising and booking information.) And the worst part of all is that there's evidently NOTHING the original members can do about it! To say we went into the concert feeling a bit cheated and disappointed is an understatement ... I had absolutely NO idea of what had transpired over the years, other than knowing that original lead singer Glenn Shorrock was no longer onboard. As such, we naturally questioned in advance how they would sound without him ... but NEVER suspected that NONE of these members were original members of The Little River Band ... or that they'd been replaced by a group of AMERICANS purporting to be the popular band from Down Under. Here in the United States we have a Truth In Music Act which states that at least one original member must be present in order to perform using the band's original name ... or they must have the legal right to use that name ... which is what appears to be the case here. Technically, that document allows them to do exactly what they're doing ... despite the fact that they are intentionally and maliciously deceiving the public and the long-time fans of the band. Checking the band's website, they give short bios about the current five members of the band, ALL of whom appear to have been born right here in The United States! (So they're not "Australian" at all ... and advertising them as such is a real misnomer!) In fact, it would seem that they have been misrepresenting themselves and their background to secure these gigs here in The States, all the while prohibiting any of the REAL original members of the band to seek work utilizing their true legacy ... and that's just wrong! EDITOR'S NOTE: I have since learned that ONE current member, Greg Hind, WAS, in fact, born in Melbourne, Australia ... and that even the ORIGINAL Little River Band, circa 1976, only had one TRUE Australian member. The story goes that in the early '70's The Little River Band were having a tough time finding an audience in Australia ... so, much like The Bee Gees had done a decade before them, they headed off to England to see if they could catch their break there. When that didn't happen, they set their sights on the United States ... some reports say they were brought over here to work as Jim Messina's back-up band ... and there may be some truth to that, as I've seen it mentioned in several places (but, oddly enough, NOT on Jim Messina's website where he traces his own bio and timeline). By 1976, Loggins and Messina had pretty much called it quits ... but in less than a year, The Little River Band found themselves recording for Capitol Records and placing records on the charts ... so this part of the story is a little bit unclear. Bands change members all the time ... and truth be told, membership in The Little River Band can best be described as a revolving door ... I've counted close to thirty different members of this band over the past 40 years! But the legal rights to the use of the name is always a sticky area. Even a group as big as Chicago can only boast one original lead singer ... everyone else handling vocals from the stage joined the band along the way ... again, some (like Jason Scheff) have over 25 years with the group now ... and he does a mean Peter Cetera imitation ... the horn section is the only other "constant" linking the band back to their earliest days. And nobody criticizes Chicago, right? This, however, seems to be an entirely DIFFERENT situation. It would appear that this group of Americans has "hi-jacked" the name of a prominent source of music from the late '70's and early '80's, and through some legal manipulation has taken their place on the touring circuit. That makes this a case of Rock And Roll Identity Theft at its finest example! As I stated earlier, we knew going in that original lead singer Glenn Shorrock was no longer involved with the band ... and you ALWAYS take a risk when you go and see a band perform live that may have the rights to the name, held by some of the more "incidental" members of the original band ... The Guess Who immediately come to mind since we just saw Burton Cummings this past weekend at the same venue ... I don't care if the drummer and bass player DO hold the rights to the name ... the SOUND of The Guess Who can be 100% credited to lead vocalist Burton Cummings, who wrote and sang every hit record the band ever had ... so, by choice, that's who WE'RE going to see ... not the "watered down" version that still plays in and around the area from time to time. Still, I wasn't satisfied ... the last thing I wanted to do was come out here and make a point about this deception without getting all of my facts in order first. 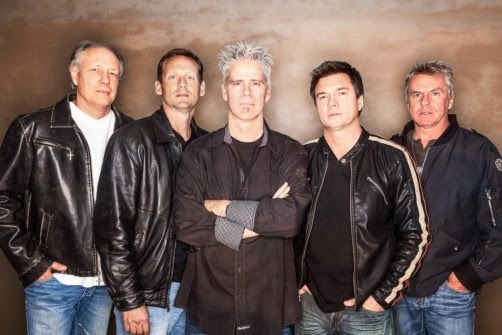 As it turns out, ONE of these guys (lead vocalist and bassist Wayne Nelson) WAS, in fact, a member of The Little River Band from 1980 - 1996 ... and has been at the helm again since 1999 ... so the TRUTH is that Nelson has over thirty years under his belt as a bona fide member of the band. Contrary to what was surmised above, he WAS with the band when they were still recording their hits ... in fact, that's him handling the lead vocal on their hits "The Night Owls", "Man On Your Mind" and "Take It Easy On Me". In my book, this absolutely counts for something ... thirty years in The Little River Band makes him a REAL member of the band. And he DID record with them during their hey-day. The OTHER four members, however, have joined over the past fourteen years ... Greg Hind in 2000, Chris Marion in 2004, Rich Henning in 2005 and Ryan Ricks in 2012 ... so these guy are, at best, Nelson recruits brought on board to carry on the name ... with absolutely NO ties to the real band. Truth be told (as pointed out earlier), the group had a revolving door of members ... there have been at least THIRTY musicians who can claim to have been ... at one time or another ... a member of The Little River Band ... so this DOES muddy up the water just a little bit! (Members have included everyone from Peter Beckett, formerly of Player ... as well as late-addition sidemen from groups like The Doobie Brothers and Air Supply) ... and since each and every original member chose to walk away from the group at some point in time, I can understand how "legitimacy" can be (at best) a VERY gray area!!! Incredibly not one of the CURRENT members (including long-time member Wayne Nelson) are mentioned on this "official" list at all ... but neither is Stephen Housden, who at SOME point along the way acquired the rights to the band's name. (He joined The Little River Band in 1981 and hung around for most of the time through 1999, when he decided to step away from performing.) Although he no longer performs with the band, he DOES own the legal rights to the name ... and, as such, he is the one granting the current line-up the use of the name (for which I'm sure he's paid a handsome royalty of some sort.) The Little River Band perform about a hundred dates a year, primarily here in The United States, to enthusiastic audiences who clearly are none the wiser! As for The Little River Band we saw Sunday Night, they were good ... genuinely good ... but it's hard for me to think of them as anything other than a TRIBUTE to The Little River Band ... especially since some of the original members are still out there, being prohibited from using their name. To a degree, I feel like we are being forced to accept the group we saw based solely on a legal document granting them the rights to use the name ... rather than any true, genuine ties to the real band ... and I have a REAL problem with them presenting themselves as being The Little River Band from Australia when this simply isn't the case. So what's the point of today's excessive rambling? I guess it's more of a "Buyer Beware" scenario than anything else. If you like the music of The Little River Band, then you will enjoy the way these guys present it live on stage. If you're not wrapped up in the details and authenticity of the band's sound, you'll probably have a great time at their concert. Like I said, they were really pretty good. However, I just can't get past the fact that they're taking credit for the REAL band's past achievements when in fact they really had NOTHING at all to do with that success. This is the third time I’ve gotten to see Ms Collins and each concert has been different. The first was about four years ago when I saw her at the Rosemont Theatre with a full orchestra. The second time was last year at the Arcada Theatre in St. Charles, sharing the bill with Don McLean. Finally this past Saturday, I got to see her again at the beautifully renovated Genesee Theatre in Waukegan. Her lead-in act was a talented singer songwriter Rachel Sage. Apparently they tour frequently together. She plays a vast majority of her own material predominantly on piano and a little guitar as well. Her style is best put as poetic-jazzy. She has a pleasant stage presence but it was lost on the decidedly older audience. (I’m sure the fact that she has numerous blue highlights in her hair may not have helped that either.) Her music tells stories and weren’t bad ... just unfamiliar. Actually, she did have her latest album, Blue Roses, released on Saturday as well. On it is a duet with Judy Collins covering Neil Young’s hit “Helpless”. By her own admission it’s her favorite song on the album ... but she didn’t perform it this night (IMO a big mistake). Judy praised her highly all night ... so perhaps with a little more mentoring she may become a future star. 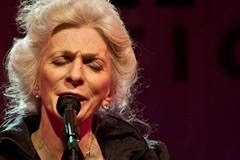 Judy Collins is a modern folk legend. She played to a far from capacity house ... their loss. At 75 years young, Judy’s voice was in top form, reaching extended highs multiple times (she even joked about it by pretending to look at her watch during one of her prolonged held notes). Accompanied by her musical director on piano, she opened with Chelsea Morning and proceeded to sing a variety of songs, including a medley of Country Roads / Leaving on a Jet Plane, a couple of Irish folk songs and a Leonard Cohen poem which she turned into one of her album cuts. Interspersed were numerous tales about her childhood and how her father influenced her career, her days in Colorado learning about folk music, the influence of Leonard Cohen and how she was influenced by traditional Irish compositions. Judy also told a story of how she borrowed a yet to be recorded song of John Phillips. When he later complimented her on it, she reminded him that it was actually his song ... he admitted not remembering that he had written it. In addition, she paid tribute to her dear departed friend, Joan Rivers, with whom she said they were planning on performing together at the time of her passing. The show closed with probably her most famous number, Both Sides Now. We were treated to a one song encore of Somewhere Over the Rainbow. She departed the stage to a standing ovation. I would strongly recommend seeing her performance if you get the chance.